When Brian K. Vaughn launched Runaways in 2003 (!!!) it instantly became one of Marvel's most popular comics, and why wouldn't it? It featured terrific writing, gorgeous art from Adrian Alphona, and a premise everyone could relate to, because what kid didn't imagine their parents as evil sometimes? Vaughn wrote a script for a movie a few years later, but that was before the Marvel Cinematic Universe had really taken shape, and afterwards it never really fit. The same thing happened with Big Hero 6, which became an animated Disney movie. But Runaways never even got that far, and so it was retooled into a TV series. And now, finally, we have the first trailer for that series which hits Hulu next month. Starring relative unknowns Rhenzy Feliz, Lyrica Okano, Virginia Gardner, Ariela Barer, Gregg Sulkin, and Allegra Acosta with Gossip Girl and The O.C. 's Josh Schwartz and Stefanie Savage as showrunners, it follows a group of teens who discover their parents are part of an evil cabal of supervillains known as The Pride. Rather than live under their parents' roofs, the kids decide to strike out on their own. You can see Schwartz and Savage's teen drama influence all over this trailer, but I can hardly blame Hulu for going in that direction. Look closely and you might see the faintest glimpse of Old Lace, Gert's companion dinosaur. That's all I care about. Screw everything else up but as long as Old Lace and Gert are cool then I'm going to watch. And yes, this is part of the MCU. Think an Avenger will show up? Yeah right. 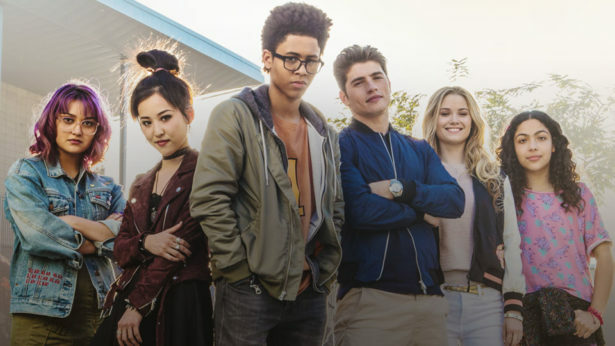 Runaways hits Hulu on November 21st.